There are many excellent TV series appeared in 2011, but which of them are the drama or TV programs with top 10 viewership ratings? Among the top 10 dramas and TV shows with highest ratings, 8 of them belongs to KBS TV channel. SBS manages to appear in the list of highest rated drama series and TV programs with Secret Garden and Deep Rooted Tree, but the drama and variety show of MBC failed to make it to the list. On December 12th, 2011, the top 10 TV shows with highest viewer ratings was released based on ratings of TNmS survy agency from January 1, 2011 to November 30, 2011. The KBS 1TV drama series “Smile, Donghae” that ended its broadcast on May 13, 2011 had the average ratings of 36.4%, ranked top on the list of highest rated shows. The conflict between characters in the drama was the main key that attract ratings. Ranked second is SBS’s Secret Garden with average ratings of 26.5% while the third is KBS 2TV’s Ojakgyo Brothers with average ratings of 25.5%. 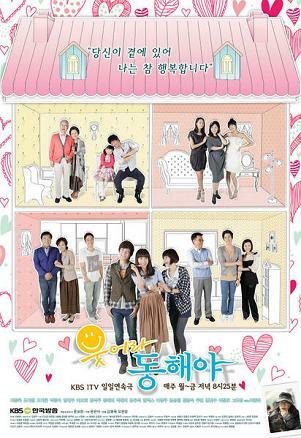 The drama was well liked by viewers due to fashion, warm love and other factors in the drama. KBS 2TV’s Happy Sunday variety show program is the only variety show to make it to the list of top 10, with average ratings of 18.4%, showing strength that on par with other drama.